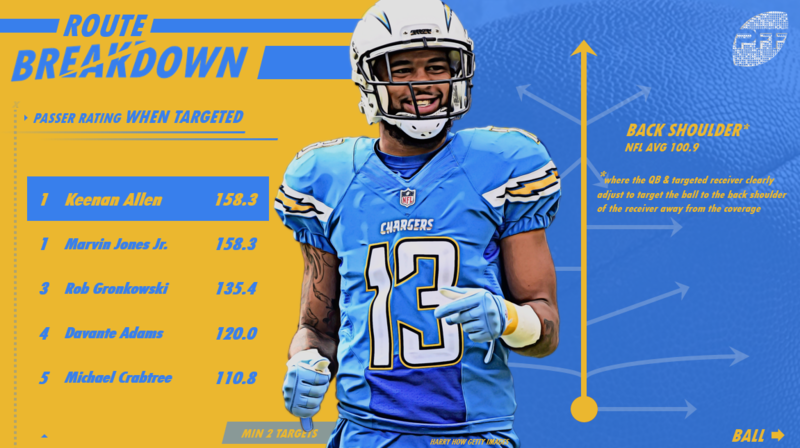 Last week, we looked at the basic route tree in the NFL and identified which receivers had the most success at running each individual route. This week, we’re going to expand the route tree and break down who had the most success on what we’ll call “advanced routes,” which include routes with double-moves, running back routes and end zone fades, among others. Just like last week we’re going to be ranking these guys by their wide receiver rating on each route, which is a quarterback’s passer rating when targeting said receiver. 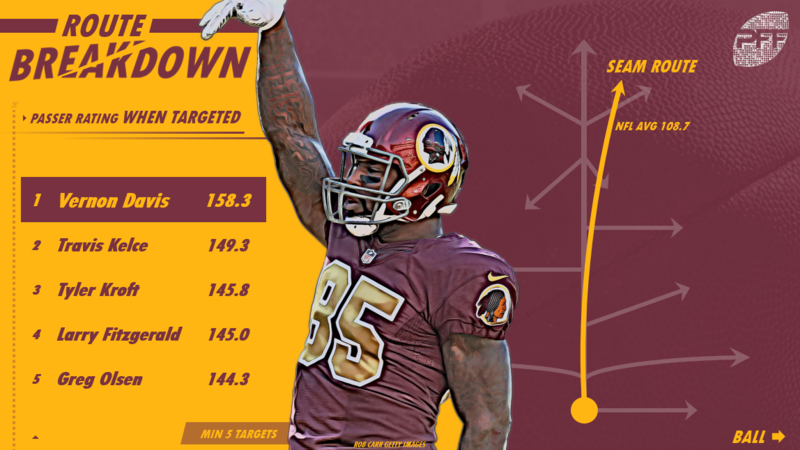 Jones Jr. ties with Hogan with a perfect wide receiver rating on downfield double-moves (routes such as corner-posts, out-and-ups, stop-and-go’s, etc.) after he hauled in 4-of-5 targets for 110 yards and two touchdowns (Hogan brought in 4-of-5 targets for 119 yards and two touchdowns). 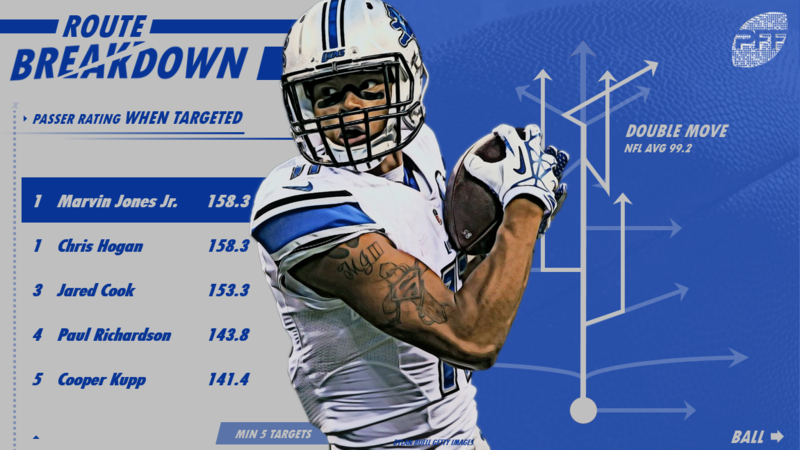 Davis hauled in 4-of-5 targets on seam routes in 2017 for a total of 169 yards and a touchdown. The one pass he didn’t reel in was ruled uncatchable due to a miscommunication. The second route on this list so far where Jones earned a perfect WR rating in 2017 and tied with another receiver, this time in Allen. The Chargers receiver brought in 4-of-5 back shoulder throws for 73 yards and a touchdown. Jones also brought in 4-of-5 targets but for 103 yards and a score on back shoulder throws. There were only 89 end zone fades thrown in 2017 and league-wide the completion percentage on the route was just 28.1 percent. 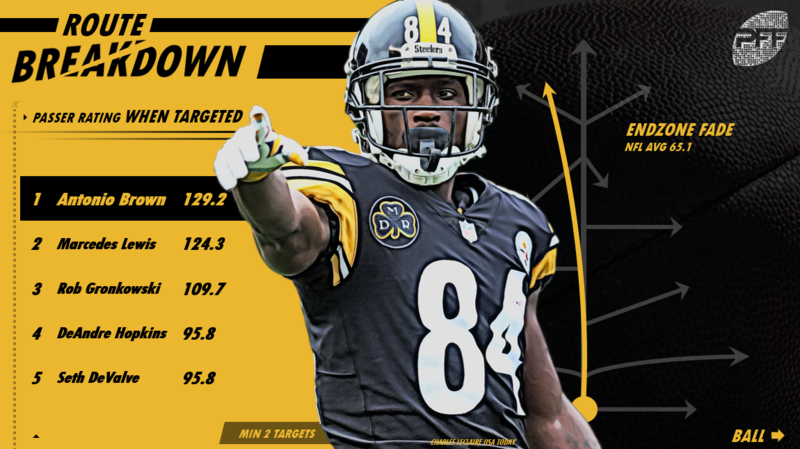 Brown was targeted twice on fades last year, both resulted in a Steelers’ touchdown. Lewis (listed right below him here) was targeted three times on fades and he caught all three for touchdowns, but the short-yardage nature of this route skews his rating downwards a little bit. 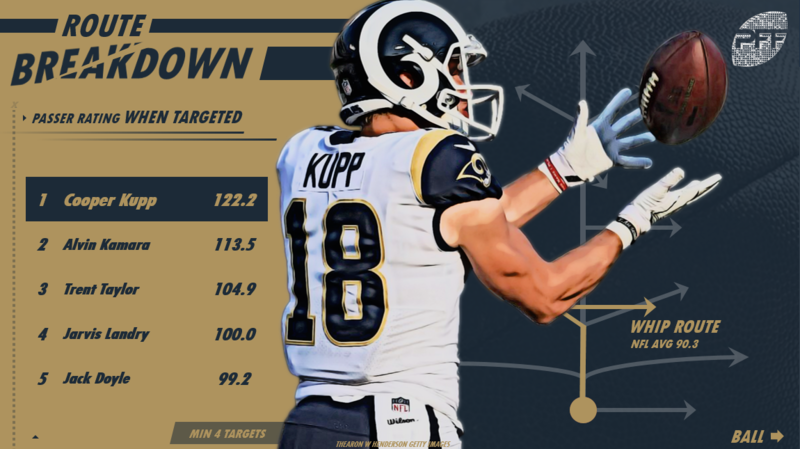 Kupp hauled in 4-of-6 targets on whip routes for 36 yards and a touchdown, with two of those other catches resulting in a Rams’ first down. There were only 41 jet sweep passes attempted in 2017, with just 11 players seeing multiple opportunities on jet passes. Cooks caught both of his jet sweet passes (there was just one incompletion league-wide last year) for a total of 16 yards with both receptions going for touchdowns. Another scarce play last season, as there were just 63 shovel passes attempted in 2017. Johnson caught both of his targets on shovel passes for 16 yards and a touchdown. Williams caught 9-of-10 targets on screen passes for a total of 119 yards and a touchdown. 54 of his 119 yards came on one catch in Week 12 against Pittsburgh. There were 2,470 RB non-screens attempted in 2017 (we classify a RB non-screen as any route that originates from the backfield that is not a screen pass) with 46 different players seeing at least 20 targets out of the backfield. Miller hauled in 27-of-32 targets for 250 yards, 11 first downs and two touchdowns.